Now that it's cold and the twinkly lights are up in force (we don't even need to turn on our lamps because we've that many lights on the go in the living room), I'm all about that candle life. And I was thinking just how easy they make life when it comes to gift giving at Christmas. You need to buy something for your Secret Santa? Candle. You need a little stocking stuffer? Totally get a candle. You don't know the person you're buying a gift for that well? Caaaaaaandle. You need a bit of treating yo'self? Can't go wrong with a candle. So I thought I'd show you a few and maybe give you a bit of gifting inspiration this month! A couple of years ago, one of my Mam's friends Helen gave her this Shearer candle for Christmas and it's so festive! Usually I find Christmas scents like frankincense and myrrh very heavy and overpowering, but not this one, not even a bit. It's smooth, mellow, has a hint of mulled wine about it, but it's basically cosy, Christmassy and I love it! I bought it on Amazon but I'm sure chemists have them too, just the effort of life for me going searching for it when it's right there online! We're saving this for Christmas eve, but can I ask you a question? Do you not think this absolutely goes with my Christmas tree with the candle lights and the nostalgia? Yeah, I thought so! Unless you've been living under a rock, you'll know that the whole Lovely Girlie Bits clan are obsessed with all things This Works. We usually pick up one of the lavender scented candles when we see them on sale in TK Maxx and have gone through so many over the years. This limited edition Petitgrain & Jasmine candle is so soothing and relaxing, almost smelling like a spa, and I feel fierce serene when I give it a whiff. I think this is a people pleaser in terms of scent as it's gentle, not offensive at all at all and is just plain lovely. The Black Spice & Cedar candle is definitely one for those who love a stronger, woody, aromatic scent. It's one you'd light after you've lit the twinkly lights on the tree, have stuck the heat on and have a glass of wine in hand. It's cosy and that's all you need to know. These are €33 and burn beautifully. Love 'em! I bought this Lump Of Coal candle recently when working with TK Maxx and I've been saving it until the tree and decorations went up! It's one of those random things I came across in there and it was only €9.99, so it came home with me. As anticipated, it smells like a fire and if you're living in an apartment or don't have an open fire to roast yizzer chestnuts and all that, lighting a candle like this will give you the fireside feels. TK Maxx and HomeSense have loads of different candles so take your time, have a proper look and you might come away with a gem. Give me anything with a motivational quote and I'm all over it! I bought this little beaut in Next in Belfast a few weeks ago and loved the sentiment. Saying yes to new adventures over the years has really paid off for me as much as my insides can try to stop me! A candle like this makes a lovely stocking stuffer and at €7.50, it's easy on the purse too. It smells like white jasmine, one of my favourite scents of all time and I'm holding on to it until the new year because come January, I'm all about those floral scents! I'm trying to remember if I've ever had a candle that smells like a perfume and while I don't think I'd be able to wear the deeply sweet Bonbon fragrance, I am in love with the candle version. It's got notes of caramel, orange blossom and blackcurrant which sounds a bit heavy, but it's really uplifting too. If you or someone you know loves the Bonbon scent, then you're going to want to check this out and they've a Flowerbomb candle too! It's currently out of stock on the Debenhams website but keep an eye in store as it's on sale! It was €45 and is now €38.25, so keep your peepers open! Ellen & Trish sent me one of their Waxperts candles when they first launched and I went ahead and burned it in warp speed because Mam and I were obsessed with it. Then I realised I had nothing to show in my gift guide so I bought another one (any excuse!) If you're a lavender lover, you're going to enjoy this and get ready for it to relax you in minutes thanks to the Lavender Essential Oil. Ellen has said that creating the candle was a real labour of love so I say "Thanks v much girdles because now when I light this, I have about 22 minutes before I'm fighting to keep my eyes open on the couch!" 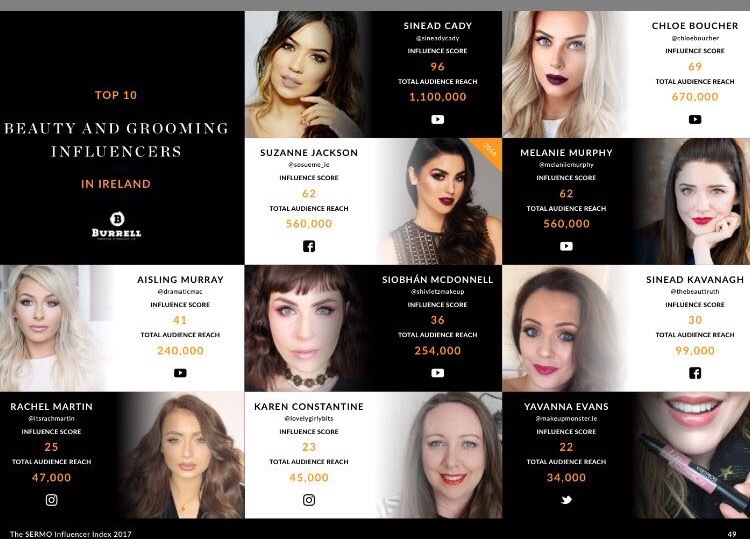 It's €30 and is available from Waxperts salons or online too. What are you go to candles for yourselves or for gifts for others? I'm always trying out new ones so which should I add to my list!? YSL All Hours primer, foundation & concealer review! Now that the weather has turned, so has my love of a dewy glow all over my visage. I've been reaching for the more matte foundations in my collection, happy out to save the highlight and dewy bits for the likes of my cheekbones. I was sent the YSL All Hours foundation along with the matching concealer and primer to test out and I've been putting it through its paces over the last few weeks! Starting off with the YSL All Hours Primer (€38). Now, if truth be told, I don't reach for primers regularly, just when I'm going out for the night and want my makeup to stay in place. But for reviewing purposes, I've been making the effort to use this with a whole heap of different foundations, just to see how it fared. With its watery texture, a little goes a long way and while it doesn't fill in my pores too much, it helps reduce the appearance of them a bit. Mainly it mattifies my skin nicely without leaving it feeling powdery or dry. Despite promising to keep the shine at bay, my nose still glistens by about lunch time with this. I've tried better mattifying primers in the past, so I'd get a sample of this before shelling out €38 if you're someone with oily bits on your mush. 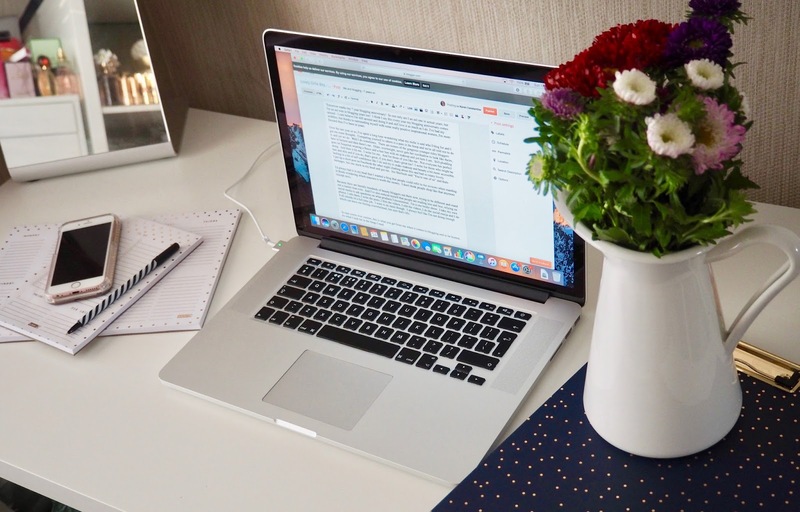 Now, as you know, when I'm reviewing foundations, I try them with a couple of foundation brushes and my makeup sponge of choice, just so I can get a feel for the formula. Because this has a thicker texture than a lot of foundations in my collection, I find that my sponge seems to absorb a lot of the product and the same goes for my brushes. I end up having to go back for another pump or two and this is an expensive base at €42, so I've been using something to apply it that I haven't used in ages - my fingers! One pump applied with my fingers gives me a light to medium level of coverage for the day and I definitely think the warmth of my fingers helps the product go even further. Sometimes I'll go back in with a tiny bit more on my cheeks as I've a good bit of redness going on there and if there's anything left on my fingers, I'll pat it into my nose. I find rubbing the foundation on dryer patches can help exaggerate the look of them. Despite me having an oily t-zone, my nose can be a bit flaky from time to time. It's not too obvious at all without any makeup on, but if I use a matte foundation like this one and the flakage is happening, it's a hot mess. Actually, it's just a mess. So if you've dry skin, this isn't the foundation for you because it will cling to any patches. Once I press the product onto my skin, without dragging it too much, it applies flawlessly, looking just like skin. Shade B20 is a perfect match for my skin tone once it dries down and I find that while it goes on initially looking a bit pale for me, it oxidises slightly on me, matching my complexion perfectly. I can usually get to lunch time, so six hours after initial application, before the shiny schnoz makes an appearance and if I powder my face in the morning, I can get another couple of hours on top of that before the shine takes over. So despite it's "All Hours" name, on me, I definitely need to touch up my face by home time if I'm heading out after work. That being said, it's a gorgeous foundation for the normal to oily skinned! The YSL All Hours Concealer (€34) is a beaut. 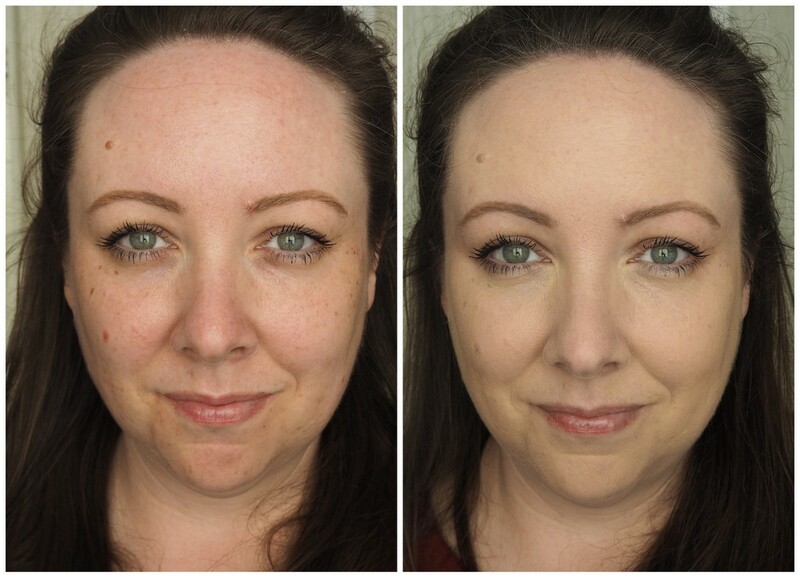 If you've watched any of my makeup demo videos on YouTube, you'll notice that I don't use concealers regularly because a) I forget, b) I don't worry too much about my under eyes and they're not that dark really and c) there are only two that I like and that don't dry out the skin under my eyes. Now I have another one to add to the collection. Shade 2 is quite yellow toned as you can see in the photos above and it does a great job of brightening my under eyes. 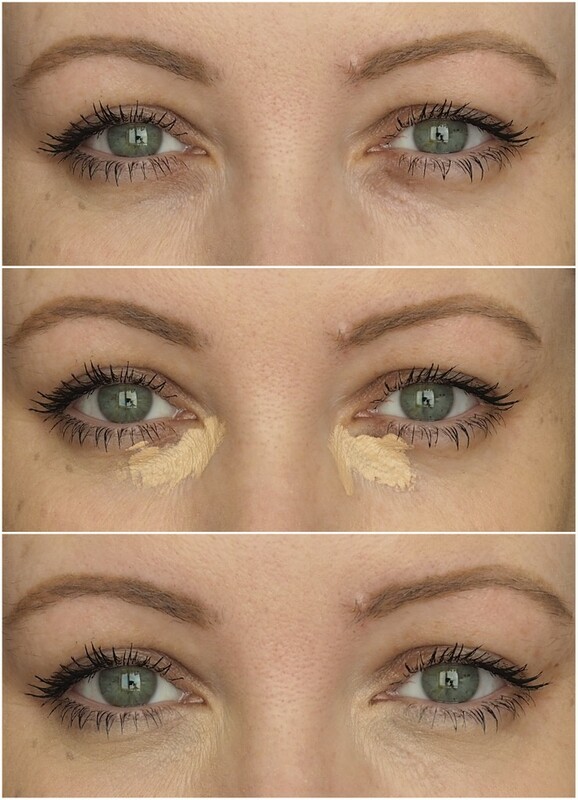 If you've dark circles, try a slightly warmer shade that will counteract the blueness. I use my fingers to pat this into the skin and it's fab! So tell me this, what's your current go to base this winter? Will you be trying out these bits from YSL? 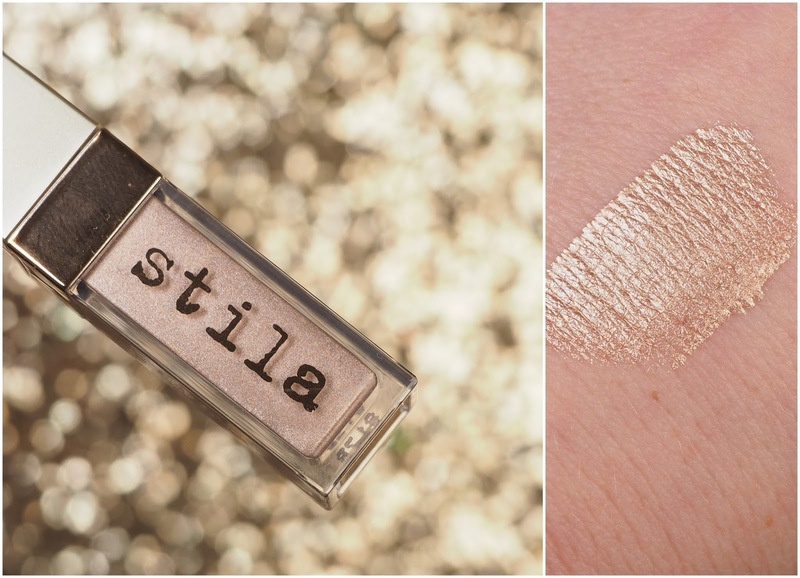 Stila Eye For Elegance Liquid Eyeshadow set review, swatches, makeup look! It's beginning to look a lot like Christmas the time where we can wear all the glitter we want all the time and not be judged at all ok bye. And I'm not even waiting until December either, so there! I love glitter. I really do and if it's not on my nails, it's on my eyes and all bets are off when the festive season hits. Or when it's a Tuesday evening and I'm in my fleece, hun bun and full glitter on the eyeballs. 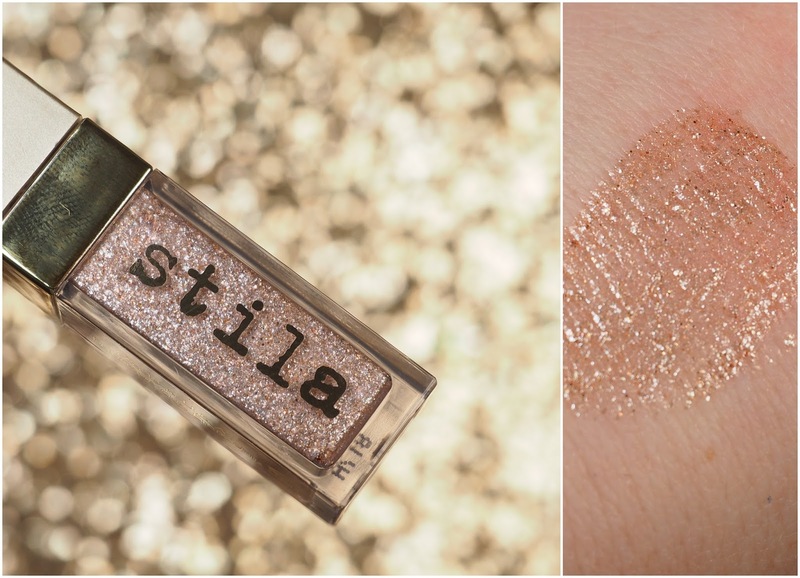 I bought the Stila Eye For Elegance Liquid Eyeshadow Set when it was 20% off on the Stila website, thanks to my Stila loving pal Mags who gave me the heads up! The set contains six liquid eyeshadows, three shimmery and three glittery. The collection was made for those of us who want to shine bright like an absolute diamond and while the tubes themselves are teeny tiny at just 2.25ml, it's a nice way to try out a few shades from the whole range all at once. I always have to prime my eyes no matter what I use and with primed lids, none of the shimmery shades crease, none of the glittery shades flake on me and they're mainly a joy to use. 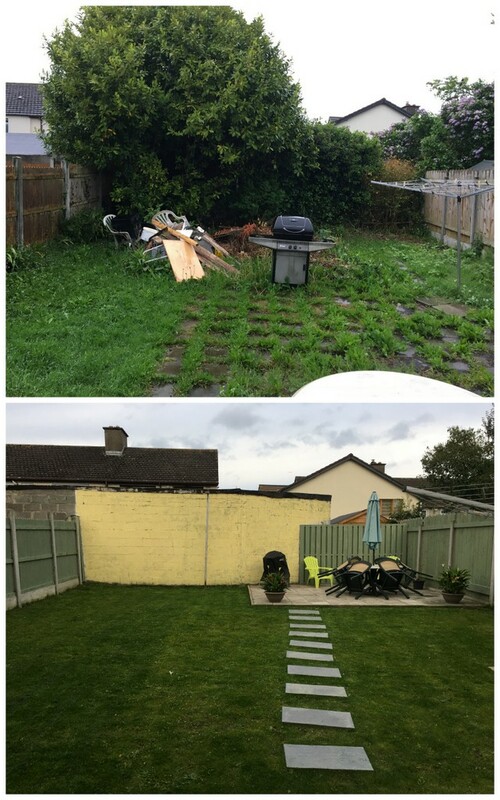 I'd a couple of small issues but I'll go into them more below. Let's look at the shades in more detail shall we? Kitten is a bright champagne shade with ever so slight pink undertones in the tube, but it translates as more of a gold champagne on me. It's a great shade for the wash of colour all over the lid on days when I want to look alive! Way back in the day, Kitten was the first ever Stila eyeshadow I bought and I still have it in its cardboard packaging. It's lovely to have a liquid version of it now and this is a breeze to use. It's opaque despite it's thin consistency and blends easily too. Grace is a beautiful mid toned bronze that I can see myself finishing first out of all six shades and it's one I'd buy the full size of too. I found it applied easily and evenly, giving me time to blend the edges. This is my perfect shade for every day use, makes a fab base for two of the glittery shades and I just love it, the end. Twig is a stunning deep red toned brown that I'm still getting to grips with. 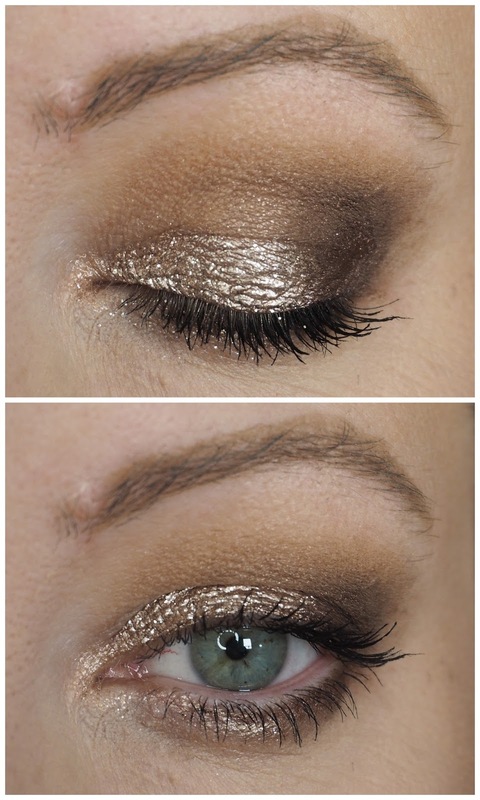 I like to use it on the outer half of my lids to add a bit of drama to my eye look. I found that this was the hardest to blend and I struggled to make the edges look softened without blending it away. That being said, I'll keep working at it because look at that swatch, it's too beautiful to just leave! Maybe this is a shade I need to not blend, and just let it set the way it is. I don't know. Sure we'll give it a go! Peachy Sheen is the sheerest of all six shades and while I wouldn't wear it on its own, it makes for a nice glittery topcoat or an inner corner highlight. 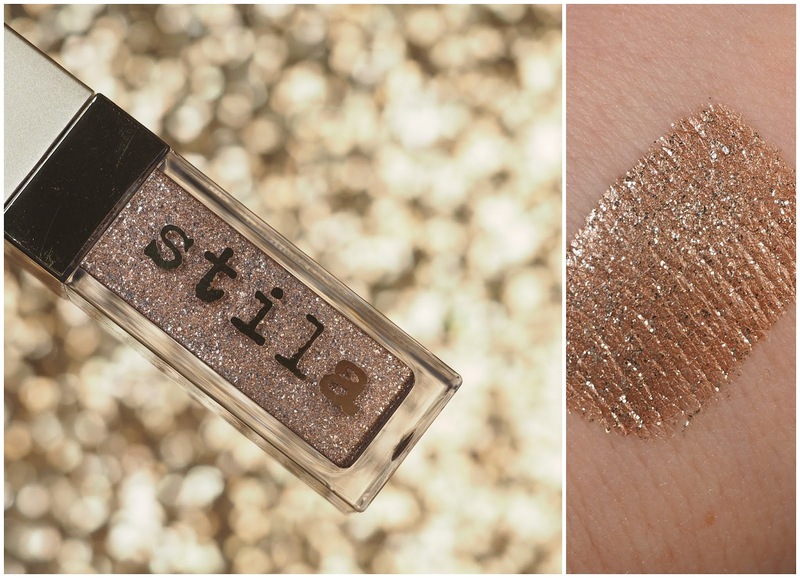 It looks beautiful over Kitten and Grace because of its sheer base and the glitter just enhances those shades. 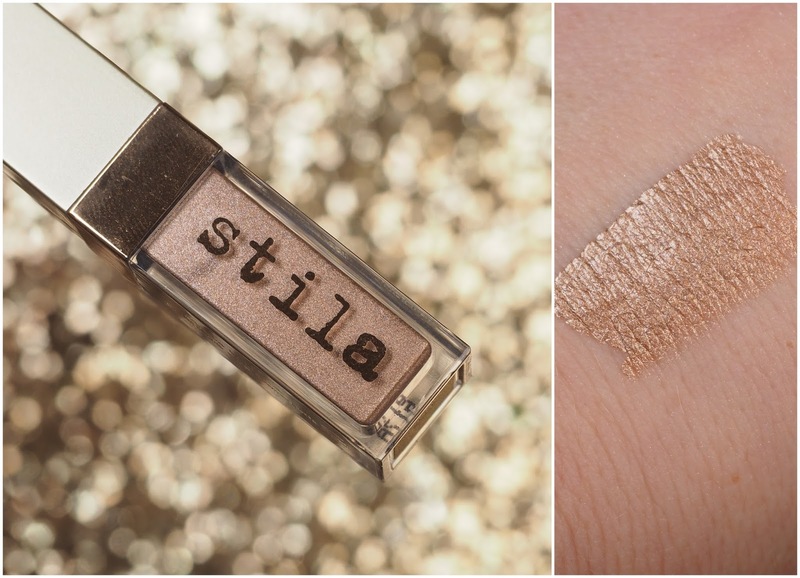 If you want twinkles on your eyeballs, this is the one for you! Smouldering Satin is my favourite of the glitter shades. I'd wear this on its own or layered over Kitten or Grace. 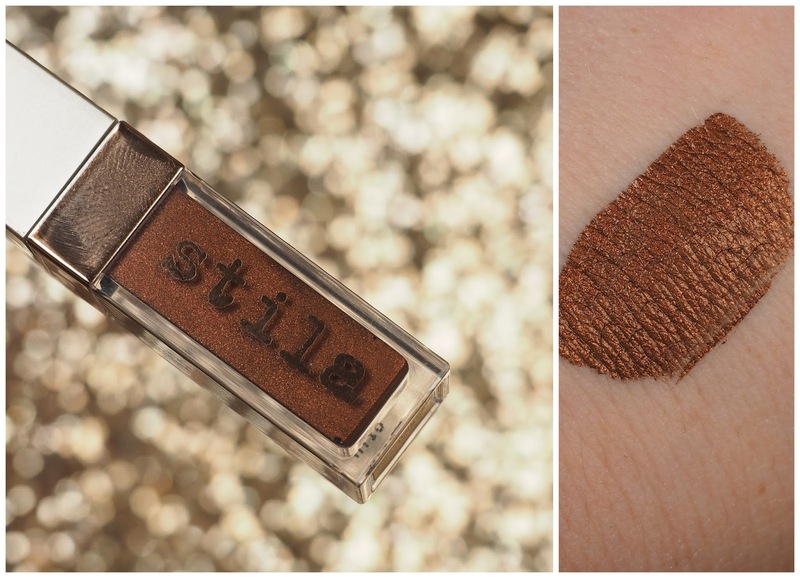 With it's bronze base and silver glitter, it's the perfect balance of a warm and cool shadow. Obsessed. It's the most opaque of the three glitters and I was happy it didn't flake on me at all. Next to Notte is a green eyeballed person's dream! It's the only shade I didn't use in the look below but I know I'll have it in rotation come December. 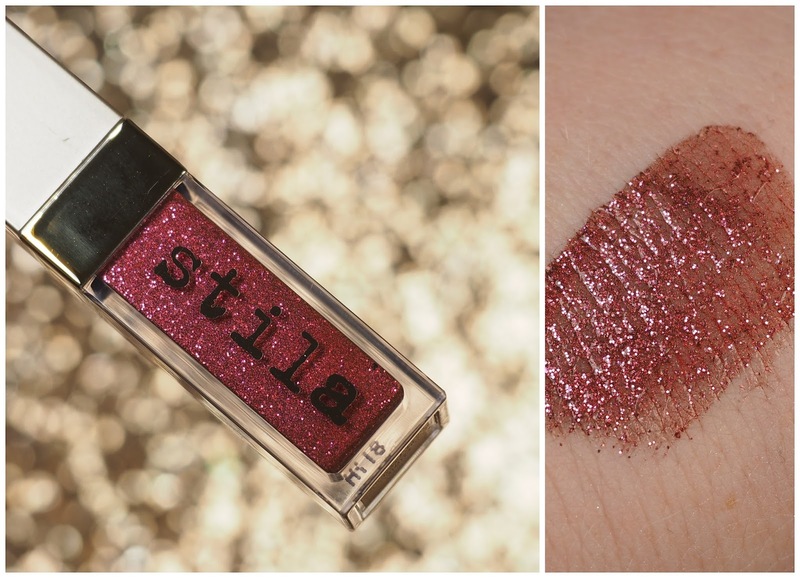 It's got a semi sheer red/pink base packed full of pink glitter that just fills my heart with twinkly happiness! Stand by for a look featuring this shade people. I filmed this look and will have it on YouTube soon, but it's the look I've worn a few times in videos and online and have had people ask what I used. As you'll see in the video, I applied a bronzer into the crease, used Grace on the inner half of the eyelid and Twig on the outer half and into the crease. I applied Smouldering Satin over Grace, applied Twig under the outer half under the lower lashes, Kitten to the inner half under the lower lashes, covering it with Peachy Sheen. Right now, this set is out of stock everywhere but keep your eyes peeled on the likes of Asos and the Stila website because this is a little gem of a gift set! I am on a spending ban. Again. I know! Christmas is coming and I really have to cut back on buying stiff I don't need, but yet I still want to try out new products! And if you're in the same boat, how about some beauty finds that won't break the bank, that completely outperform beyond their price point and are just plain deadly. And yes, I do use the phrase bum hole in this video, along with acting out what a bum hole looks like. I also talk about jumbo holes and how we all need one. What is wrong with me? Anyway, I have some budget skincare, some really affordable makeup and if you'd like a video on the eye makeup I'm wearing, just let me know! And make sure to subscribe to my channel as I'm going to have lots of videos coming up in the next few weeks! I went, I shopped, I found some treasures! After giving you the heads up last week about the Big Brand Flash Events happening all month in TK Maxx, I decided to go treasure hunting myself to see what I could find. With a €100 gift card to spend, I took my time, and got some beautiful things. Wait and see what I picked up! Last week TK Maxx had bargains for the bedroom and bathroom, including cosy bed linen and towels, beautiful crockery, knitwear for everyone and designer activewear for kids. And like I always advise you, be quick lads because things move fast in TK Maxx as I'm sure you well know! FOMO is never a good thing, but I'm still going to show you what I got! With the big brand flash events ending next week make sure you head to store so you don't miss out! Now the day I went shopping was quite a day for me because for the first time ever, I got excited over soap dispensers - I know! The had the cutest, most festive soap dispensers ever and after much deliberation, I decided on this Christmas tree one (€9.99). I'll share the photos of the other ones on my social media, but who doesn't want soap coming out of a tree?! And because our bathroom is quite neutral, I went for red hand towels to add a pop of colour. They had so many sparkly towels, embroidered towels, plain towels, jazzed up towels and don't even get me started on their tea towels... I was in heaven! For years I've wanted to get some festive tableware and fell in love with these plates (€5.99 each) and bowls (€3.99 each). I'm going for either a red and gold or red and white theme for my table this year and these will go perfectly with whichever I choose. Imagine the bowls heaped with roast potatoes and veggie (not sprouts though, ugh). Christmas dinner is my favourite meal ever and now it's going to be even better! I'm obsessed with these little small bowls (€3.99 each) for snacks and nuts and I know already that we'll be using them tomorrow night watching Strictly with a nice glass of wine. They're all such good quality and I know I'll have them for years to come and will be able to add to them too. I'm a candle fiend and can spend ages in TK Maxx giving them all a whiff. And when I saw this one called "Lump of Coal" (€8.99), I hoped it would smell like a fire and it does! We were always told as kids that if we were bold, Santa would only bring us a lump of coal and now I've gone out and bought one myself! I bought this little "Santa please stop here" wooden decoration (€5.99) of Matthew as it's his first Christmas and we have to make sure Santa knows where to find him! Give me anything gold and sparkly for the festive season and I'm all over it. And to make it even better, this gold garland jingles (€9.99)! I have actual jingle bells for the house this year! Finally, I couldn't resist these battery operated wooden lights (€7.99). I saw a more expensive set in a garden centre recently but they were out of my budget. These were much more affordable and I already know where I want to put them! Now, for my fellow techies, this week TK Maxx have a huge range of headphones and speakers which would make fantastic gifts for your loved ones (or yourself!). I really do need to get on board with the light up message board for the office, or maybe I could get one for baby Matthew's nursery? Either way I'll be checking them out myself. I'm dying for my friend Catherine to check our their drones as that's been on her wish list for ages and for those who still collect their vinyls, TK Maxx have turntables! Are you able?! And as Santa is coming in just over 5 weeks, there are going to be amazing bargains on toys, so Matthew is sorted for this year. And maybe next year too! Happy treasure hunting! 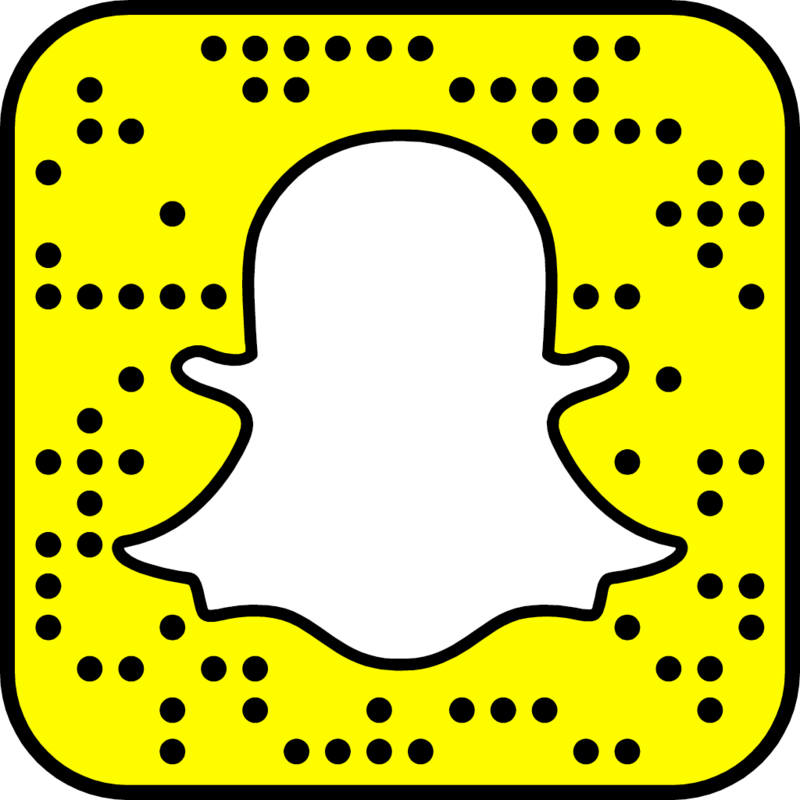 Stay tuned to the blog and my social channels for more insider updates throughout the month.